I will say this question is a battle between Source and experience. 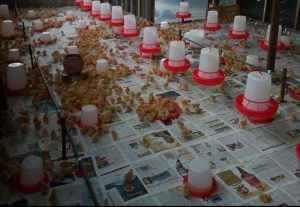 When it comes to this issue, the decision mainly lies on the experience of a farmer as regards brooding chicks and the quality and source of the point of lay birds with respect to purchasing POLs. More expressly put, brooding is a technical sequence of proper management activities that requires a lot of poultry knowledge and experience that would ensure that the final resultant pullets would be quality laying birds. Without which will result to poor quality, not so performing layers that would give the chicken farmer a good return on investment once laying begins at the appropriate time. Considering the variety of performance indicators involved such as liveability, egg production, egg size/mass , body weight, it is expected that a farmer without experience should seek for opportunities to acquire such experience in any nearby poultry farm before starting with a few number of birds for personal/self development. However, as regards purchasing point of lay chickens, the source of the birds must be thoroughly examined for a variety of conditions such as the body weight at point of sale, the complete vaccination history, the quality of debeaking done, the flock uniformity which must be at least 80%, the poultry droppings in the pen where they are raised and so on. If the point of lay source/supplier doesn’t provide the full details as regards the above criteria and/or doesn’t meet up with the stated conditions, then the buyer should out rightly reject the birds to avoid future regrettable consequences like low production percentage, small sized eggs, low peak production, short peak duration, frequent/ periodical mortalities, poor egg fertility if birds are breeder birds and so on and so forth. In summary, if the famer is inexperienced, he can as well gather the experience from a practicing farmer to acquire the necessary poultry farming knowledge needed to succeed. But if he can’t afford the luxury of time, he/she can simply go for point of lay birds if only majority of the conditions stated above are met by the point of lay supplying farm.